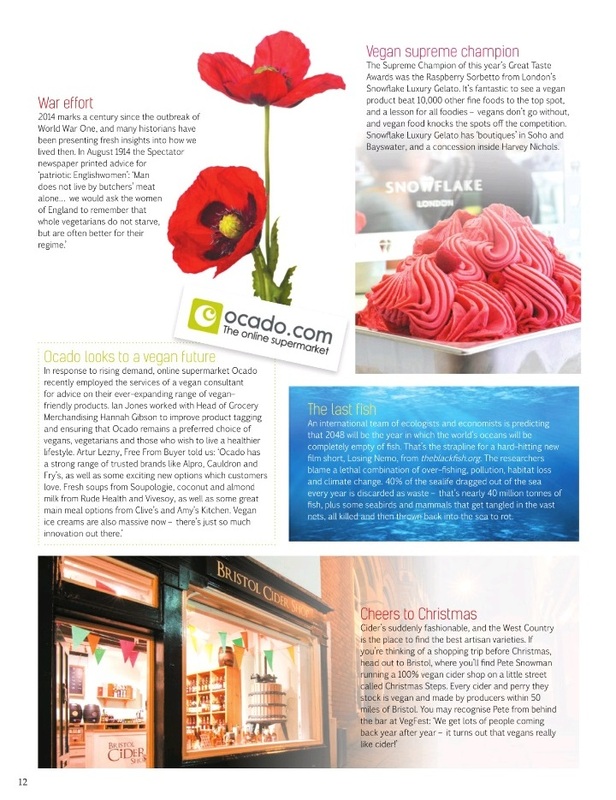 Vegan Life has launched its second edition this month, bringing winter and Christmas into focus. It's still not too cold here yet, but as the Starks would say, winter is coming. Christmas is too. Vegan Life has you covered for both. As with the first edition, certain articles held particular interest for me and they are the pieces I'm focusing on today. For example, I was pleased to read that the online supermarket Ocado is aiming to increase its vegan range - a nice move from a company that is already vegan friendly. A vegan raspberry sorbet by Snowflake Luxury Gelato also won a supreme champion Great Taste Award, in an open (non-vegan field) in London. If I have the urge for a final summer dessert before the cold weather descends, I know where to head. I was particularly delighted with an article on veganism as distinct from 'clean' / restrictive / super healthy eating, written eloquently by Rebecca Bourne. I understand that some vegan eaters also avoid processed foods, packaged vegan items, false meat products and so on - and obviously eating those things all of the time is not great for one's health. Eating a vegan diet does also tend to go hand in hand with eating more vegetables, fruits and whole foods. However, there are packaged or treat products that are vegan, and someone is no less of a vegan for eating them. I do worry when I read blogs or reflections that paint such products in an evil light, especially if that view is framed within the context of veganism. Veganism is about avoiding animal products and by products - not all refined foods all of the time. If we can have compassion and care for all living things, surely we can extend that to understanding why the odd packet of vegan confectionary (or whatever) may appeal! 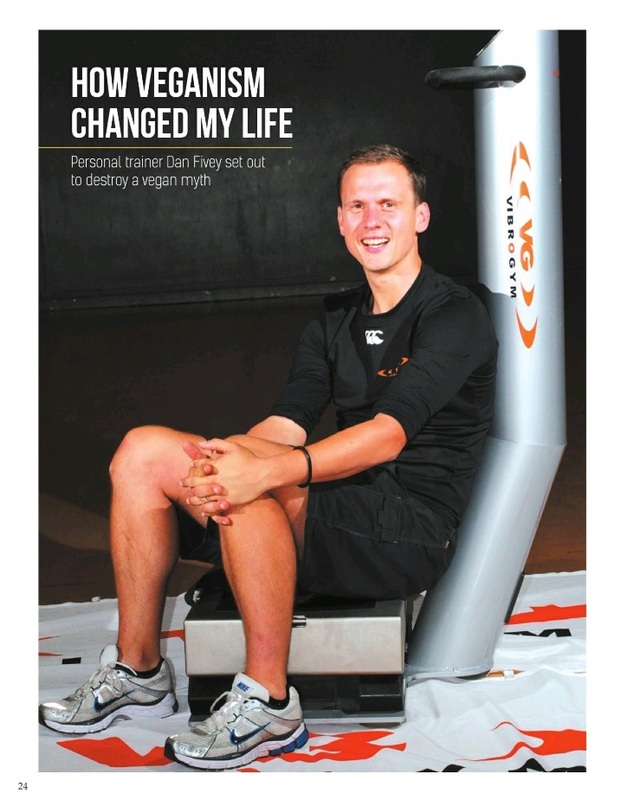 Vegan treats aside, I also enjoyed Dan Fivey's story about becoming a vegan athlete and personal trainer. There are plenty of vegan athletes out there, but so many people still believe that if you want to build muscle or be competitive in sport, you need animal products. The more stories that are shared from people like Dan, the greater the chance that those myths can be laid to rest. This also seems a good time to mention that I finally made a variation on the raw apple cake featured in the first Vegan Life edition. I would have liked the follow the recipe exactly, but adapted the ingredient list to what I had to hand. Thus, I used almonds instead of walnuts, dates instead of raisins, and oats instead of coconut. I also kept my icing minimal - more of a drizzle than icing. The resulting slice was not entirely raw (due to the oats) but it was entirely delicious. If you'd like to make a similar treat yourself, Sharon from A Bit of the Good Stuff has posted her variation of the Vegan Life recipe. Have you read the latest Vegan Life? Did any stories ring true for you? I've read a couple vegan mags this week (online) and received one of my print magazines. 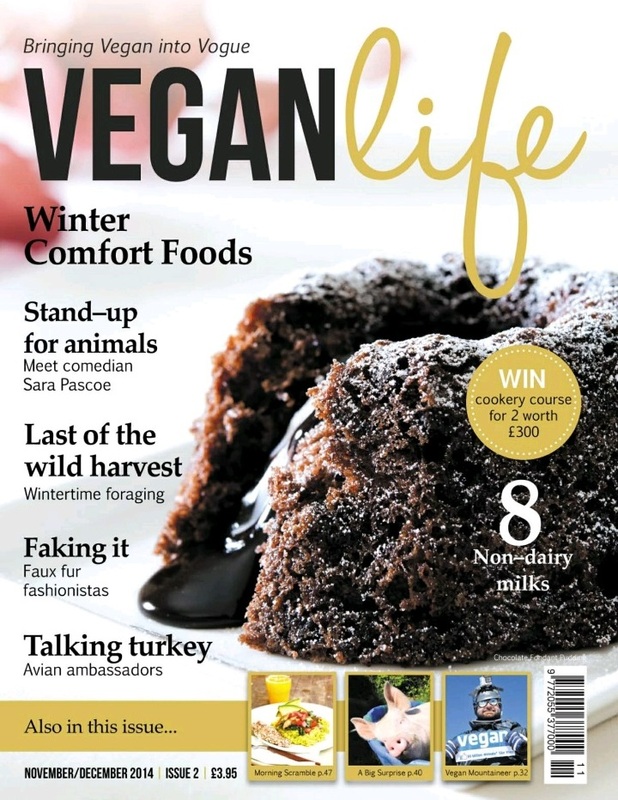 Vegan Life really does look great, I'm so pleased there are more vegan publications out! The chocolate cake on the cover looks amazing. The article on veganism and clean eating is really interesting and opens a whole can of worms of issues of what being vegan means, and like you say, of what being compassionate means. Sounds like a great magazine! I love hearing about vegan and vegetarian athletes spreading the word about how you can be a strong competitor without animal protein! I haven't heard of that magazine before, but the cake on the cover looks amazing!